It's time to prep your grill for a cookout delivered to your door.... and it all starts with our Premium Cookout Assortment. 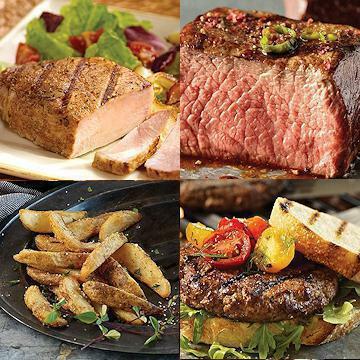 Filled with all the cookout essentials - naturally aged steaks, center cut chops, grill-ready burgers, and more - this combo is guaranteed to please anyone that gathers around your grill. Want more? How about FREE SHIPPING? You got it! Order this money-saving combo today and it SHIPS FREE. Save big. Eat great. That's Send a Meal! Grill: Preheat grill. Remove pork chops from package. Pat dry, season as desired and cook over medium heat for approximately 4-7 minutes per side until internal temperature reached 145 �F. Broil: Preheat broiler. Remove pork chops from package. Pat dry, season as desired. Place on broiler pan 3-4 inches from heat source. Broil 4-7 minutes per side until internal temperature reaches 145 �F. Contact Grill: Preheat contact grill. Season thawed pork chops. Grill 4-5 minutes for a 4 oz. chop; 5-6 minutes for a 5 oz. chop; 6-7 minutes for a 6 oz. chop. Thaw in Refrigerator. Remove burgers from packaging while still frozen. Grill or Broil: Thaw burgers. Grill or broil for 5-6 minutes per side until internal temperature reads 160�F. Overcooking can result in a dry product. Contact Grill: Grill for a total of 5-6 minutes until internal temperature reaches 160�F. It's easiest to remove burgers from the wrap while still frozen! Pan Fry: Preheat a small amount of cooking oil in non-stick pan over medium heat. Add burgers, pan frying for 6-8 minutes on each side or until internal temperature reaches 160�F. Oven: Preheat oven to 450�F. Line a baking sheet with parchment paper or aluminum foil and lightly oil. Remove Omaha Steakhouse fries from packaging and distribute on the baking sheet leaving space between fries. Place baking sheet in oven on center rack. Bake for 18-20 minutes. Grill: Preheat grill to medium. Remove� Steakhouse Fries from plastic packaging and place on a perforated grilling pan. Heat over grill for 15-20 minutes, stirring constantly. Beef, Pork, Lamb, Veal and Poultry have been born, raised and harvested in the USA. Single ingredient beef, veal, chicken and lamb are produced from animals that originate from the United States. These products are processed in our plants in Nebraska, USA after undergoing a strict series of quality checks and under the supervision of the United States Department of Agriculture.